Cowboy Joe mounts his steed. 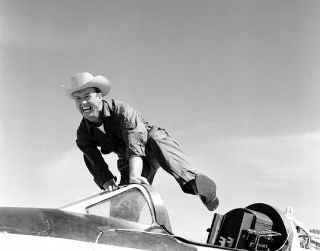 In this historical photo from the U.S. space agency, Cowboy Joe (NACA High-Speed Flight Station test pilot Joseph Walker) and his steed (Bell Aircraft Corporation X-1A). A happy Joe was photographed in January 1955 at Edwards, California. The X-1A was flown six times by Bell Aircraft Company pilot Jean "Skip" Ziegler in 1953. Air Force test pilots Major Charles "Chuck" Yeager and Major Arthur "Kit" Murray made 18 flights between November 21, 1953 and August 26, 1954. The X-1A was then turned over to the NACA. Joe Walker piloted the first NACA flight on July 20, 1955. Walker attemped a second flight on August 8, 1955, but an explosion damaged the aircraft just before launch. Walker, unhurt, climbed back into the JTB-29A mothership, and the X-1A was jettisoned over the Edwards AFB bombing range.